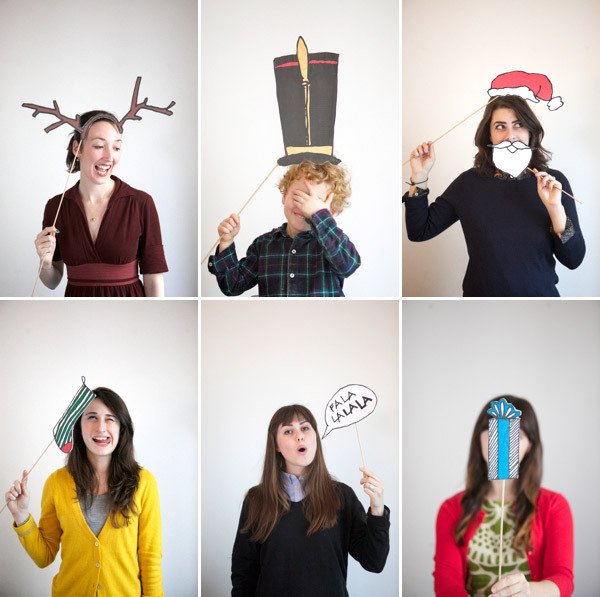 I had several requests for a set of holiday photobooth props. So I asked Lauren Stiebler whipped up this cute set. All you need to do is print them, glue them to foam core, cut them out with an exacto knife, and add a stick! It’s really easy! To download just right click on the download button below or download them right here. You can find all my photobooth props right here and full instructions on how to make them on this post. Thanks to Lauren Stiebler for the illustrations, Vivian Lee for assisting, and Meg + Caroline + Anne + Lindsey for letting me take their picture! These are so cute! I used your previous templates for a cowboy party my mom and I hosted in October. I haven’t posted photos yet, but will be sure to send you a link when I do. I had the HARDEST time getting them cut out! Any tips on how to make that process easier? My edges were super jagged. Having a really sharp exacto knife and using thin foam core is the key. Go to the art store and get the thinnest they make. heheh these turned out so cute!! This is the cutest idea every, I can’t wait to download these!! This would be an awesome idea for the dreaded holiday family photo! These are awesome! Had a bunch of kids using these props the other day and pictures are so fun! Thank you!! I took mine to a nursing home after we used them at our office. The old ladies loved them!!! The nutcracker is fantastic! We did this, too, and spent a ton of time brainstorming prop ideas. We ended up making a Snowman (top hat and carrot) Mr and Mrs Claus, Elves, the Abominable snowman and Rudolph. I love that you put your “handles” on diagonally- keeps the kids hands out from in front of their faces! We also tried to set them up with an icicle light backdrop, but we couldn’t quite get it right. Hey! I really loved this idea from You, it’s so cute So with your permission I printed the illustrations to make the same idea with my family. I have just to say you that they loved the idea also and wed had a really great time. I will upload the pictures soon, if you want to see them, just visit my blog. party photobooth. « joie de vivre! Glückspaket, und auf bald… « Kompromisslos toll.